Peppermint hard candy drops. 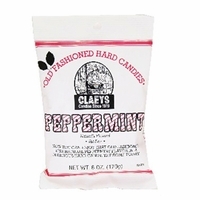 Claeys old-fashioned peppermint drops are a hard candy with a cool peppermint flavor. Each peppermint drop has a thin layer of fine sugar and made with 100% natural peppermint oil. If you like peppermint flavored candies these are a must have, not only to they taste great, but they are also made in the USA.